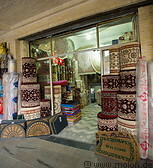 The Grand Bazaar lies near the Golestan palace in Tehran and is world's largest bazaar. The bazaar was already established in the 17th century and was rebuilt or renovated over the centuries. In one part of the bazaar there are several shops selling nuts and dried fruits, while in the other parts of the bazaar there are other goods for sale, ranging from traditional handicrafts to modern goods.